Familiarity breeds contempt, yes, but also, contempt breeds contempt. 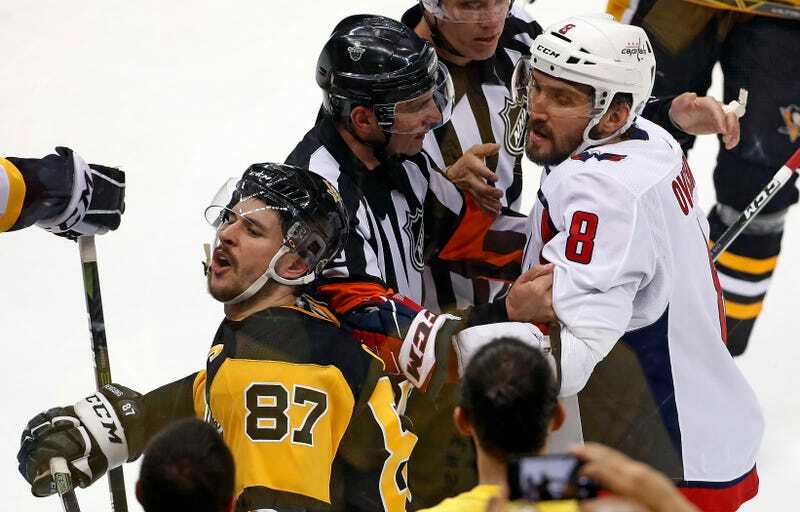 The Capitals and Penguins would dislike each other even if they didn’t meet four times a season and then again seemingly every spring, but the prolificity of the rivalry gives the bad blood the time and exposure it needs to ripen into an exquisite bouquet of hatefulness. Aston-Reese suffered a concussion and a broken jaw that will require surgery, and is done for the year. Wilson was not penalized for the hit on Aston-Reese, but he does have a disciplinary hearing scheduled for today. “At some point, we would hope that the league might do something,” Pittsburgh coach Mike Sullivan said. In his press conference today, Caps coach Barry Trotz said Wilson wasn’t laughing at the injured Aston-Reese, but instead that someone on the bench had said something to Wilson about the deafening boos, and he was reacting to that. I’m not sure if Crosby spit here. It certainly looks worse in slow motion than at real speed, where it appears the head movement could have just been him getting yanked back by Ovechkin. But this debate isn’t confined to fans Zaprudering the footage; it’s apparently a topic of discussion in the Capitals locker room. In his presser today, Trotz gave an answer that’s on its face noncommittal, but would seem to hint that he believes there was a loogie. Game 4 is Thursday night, and whether Wilson’s there or not, there are going to be scores to settle. Oh, and a really important hockey game.